How do I add a new country to my collection? You can add a coin to your collection, not a country. If the coin you add is of a country you don't yet have, then you will have a new country within your collection. I am very new to this. 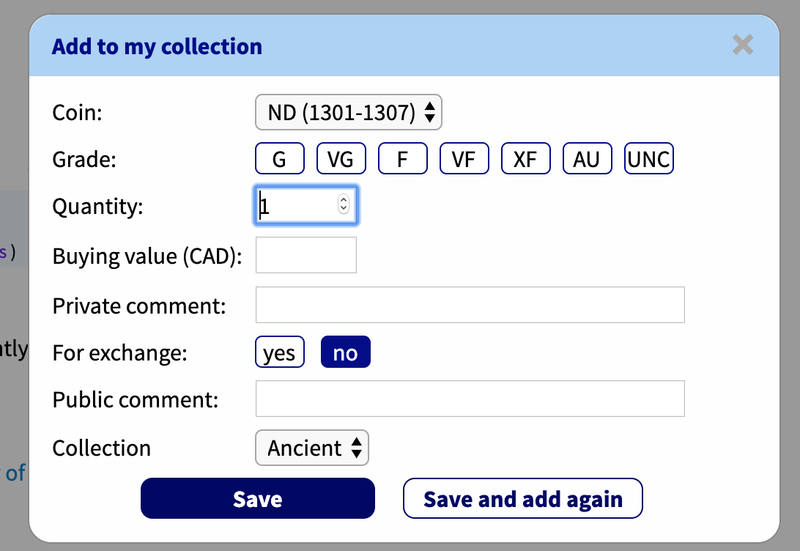 Do I add the coin under Catalogue or under under coins? I ask as it seems to have a default country (one of the ones I created at the beginning) at the bottom of the data entry screen and doesn't allow me to change it. Not sure I understand your problem correctly. Enter the data in the popup window that opens. Or maybe you are talking about the dropdown menu just above the "Save" button? i.e. where is indicated "Ancient" in the above picture?